Before you begin, Set a quart of water on to boil (I use a tea kettle). If it boils before you are ready to use it, turn off the heat and leave it covered. In a dutch oven over medium high heat, saute the carrots and onions in 4 Tbsps. butter for 5-10 minutes or until they begin to brown. Remove carrots and onions from pan to a covered bowl. Saute beef for 3-5 minutes, until it begins to brown. Turn once and cook for 3-5 more minutes. 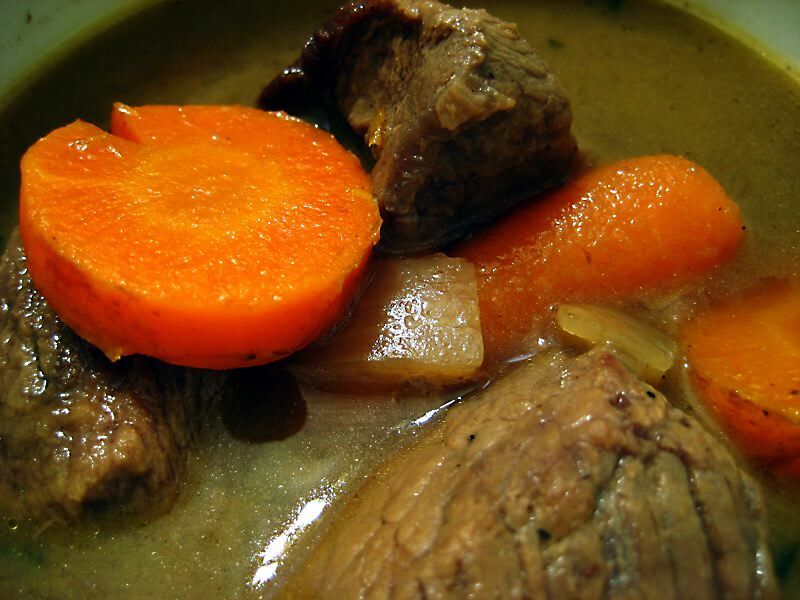 Remove beef from pan and put with carrots and onions in covered bowl. Add about 1/8 inch of water to pan, scraping bottom of pan to release all the brownings. This is where your soup gets much of it’s flavor and all of it’s color so do a good job. Add garlic and spices to pan and cook for another minute. Don’t let pan go dry! Return carrots, onion and beef to pan and cover with 1 quart of hot water. Simmer on medium for 35 minutes or until carrots and beef are done. Taste soup and salt to taste. Melt remaining 2 Tbsp. butter into soup. Additional vegetables can be added such as mushroom. Just follow the same sauteing procedure. This is sooo good. It made it on my daughter’s wedding dinner menu. I used a little scd legal wine to deglaze the pan. Thanks for the feedback. I’m glad you enjoyed it. The wine sounds like a great idea.